When George H.W. Bush made his first trip abroad as president, it was to Canada. And while he didn't spend much time here during that initial visit, it was long enough for him to try out his French and to experience Canadian winter. Bush arrived in Ottawa in February of 1989, three months after he'd been elected as the 41st president of the United States. During a six-hour visit, Bush met with Prime Minister Brian Mulroney. The two leaders discussed the free trade agreement, as well as the issue of acid rain. 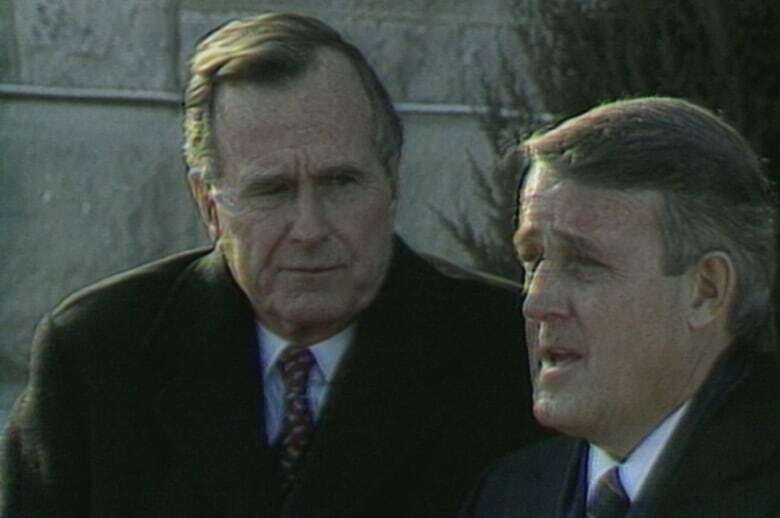 When Bush and Mulroney later spoke with reporters, the president made a memorable comment about the weather. "It's colder than hell," he said. He also made very brief use of some French, which The Globe and Mail said followed a proposal by Mulroney — also in French — to answer another question from a reporter. "Mais, oui," said Bush. "C'est fine pour moi." Bush, who recently died at the age of 94, would make four visits to Canada during his term as president, including his initial visit to Ottawa. From 50 years ago: What will Richard Nixon's presidency mean for Canada?